A week like this doesn’t come around too often, firstly a £15 Atari 2600 bundle that I could not say no to – you can’t have too many Woody’s in your collection! It also had some great classic games with it, as pictured below. Later in the week along came a 2600 Vader boxed in very good condition, one from my Wishlist. With this being the week the new Star Wars movie ‘Rogue One’ was released, it was definitely good timing!! Thanks Gumtree for these two great finds. The Atari 2600 has always been one of my favourites as the Woody was the first console I had as a kid. Hence the fact there will always be one in my collection plus numerous spares as back up. I never had the black Vader version however I have been on the look out for a decent priced one for the collection for quite a while now. To get one in this condition and boxed is definitely a bonus. Nice to have all the paperwork and booklets with it as well, shall I join the Atari Club for £1? • Sears Video Arcade – a rebadge of the original 6 switcher made in 1977 plus a 4 switch model in 1980. The photos below are from the one in my collection that has been AV modded so I can use it on a projector. • 4-switch model from 1980 looking like the original console. Sadly still looking for one of these. The all black “Darth Vader” 4-switch model from 1982. 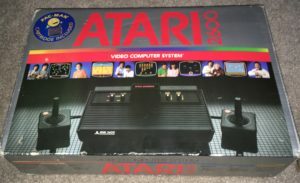 This was officially the first version to be called the “Atari 2600” as the “Atari 5200” was released in the same year. • The Atari 2800 was the Japanese version of the 2600, released in October 1983. This is not in my collection but I had to share a photo as it looks great and influenced the 7800 design. 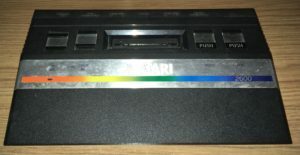 Atari 2600 Jr. released in 1986. This was the budget edition that can play all the classic game cartridges. There were two versions of the Junior with this one from my collection being the second version that has the wider rainbow design. 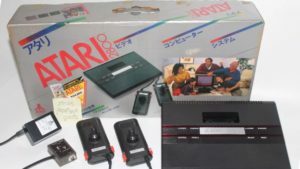 • There was also an all black version of the Junior console plus numerous 2600 clones produced including ones with built in games. I will leave you to search for these on the net. If I do get anymore I will be sure to share the photos. Let me know what versions of the 2600 you have in your collections. 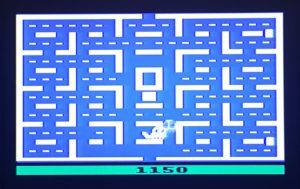 If you also let me know what is / was your favourite Atari2600 games I will see if I have them so I can share some game play photos and video clips.